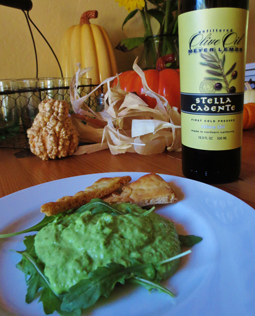 Pea Pate - A recipe from Savor California, the online showcase for extraordinary gourmet foods and beverages from California. This recipe highlights the greatness of the oil just perfectly. It's almost as good as slurping spoonfuls. Since it is authentic "raw" and "vegetarian" food, it's very good for you, probably a tad better than straight olive oil. Peas are what really put this recipe over the top. Grind up the peas and beans in a blender, not a food processor. You have to keep stopping and helping them to get chopped up. Once they are finely chopped, drizzle the oil through the lid of the blender slowly. Stop and help out with a wood spoon when the blender plasters everything to the sides of the jar. Add salt; add water, and keep drizzling oil, until you get the smoothness of pate you desire. Serve with a fine leafy sprout on top. The pepperiness of arugula sprouts is divine against the fulsome lemony flavor.